You are here: Home / competitions / WIN a trip to the ZOO! As the summer comes to a close there are still one or two definite must do’s in the calendar. The most obvious one is Zoo Project Festival taking place in Port Lymphe Wildlife Park, Kent. The line up is immense and you can party with some actual animals! Here at PSTV we are giving you and 3 of your mates a chance to win VIP tickets to the festival. All you have to do is email gojo@plainandsimple.tv and tell us your favorite animal and your favorite dj from the lineup. Check it out here. 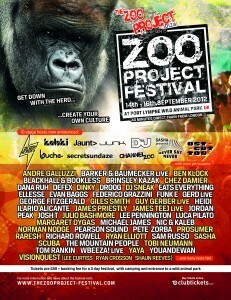 Bigger than an event and better than a festival, nestled in the countryside of England, for 3 whole days you will be able to experience the liberating & creative Zoo Project imprint set to the sounds of over 50 amazing artists, across 10 stage hosts, on 1 active safari park, leaving you with zero reasons to hesitate. Taking place at Port Lympne Wild Animal Park from the 14th-16th September, The Zoo Project Festival is the first in what will be an annual festival and will see thousands of music fans experience cutting edge electronic music from within the grounds of an active Wild Animal Park! Set on 600 acres of stunning grounds, Port Lympne Wild Animal Park features a historic mansion and landscaped gardens with spectacular views over the Kent countryside stretching out to the coast. It is also home to the largest breeding herd of Black Rhinos outside Africa as well as Siberian and Indian tigers, African elephants, monkeys, Barbary lions and many more rare and endangered species. Revelers will take a walk on the wild side as they enjoy immersive, expressive and experimental music and culture. DJ Sneak, Scuba, Sasha, Ben Klock, Chez Damier, Norman Nodge, Visionquest, Prosumer, Raresh, Ilario Alicante, Margaret Dygas, André Galluzzi, Julio Bashmore, Tobi Neumann, Dinky, Giles Smith, James Priestley, DROOG and GERD are just some of the artists announced for the first ever Zoo Project Festival. Win – VIP tickets to Jacks Festival with Krafty Kuts, Crazy P, Audiojack and more! WIN 2 pairs of tickets to Drumcode. Slide presents DIMITRI FROM PARIS – win tickets!